In a previous blog post, “Einstein’s Crazy Idea“, I discussed how Einstein’ s theory of general relativity is a reinterpretation of gravity. Newton’s original idea of gravity visualized it as a force between massive objects. Einstein instead surmised that the presence of mass warps space, and that curved space-time produces the motions we attribute to gravity. Earth’s orbit around the Sun is either a curved path through flat space (Newton) or a straight path through curved space (Einstein). Both ideas of gravity produce the same observed motions for most cases. But there are a number of situations, generally involving very strong gravitational effects, where general relativity explains phenomena that gravitational forces get slightly wrong. The differences are often subtle and take quite a lot of explanation to appreciate. However, one example is visually obvious: gravitational lensing. 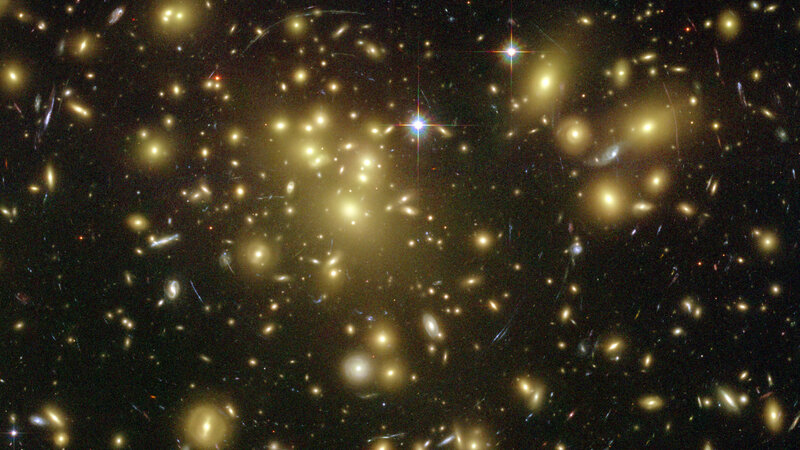 Hubble image of galaxy cluster Abell 1689, showing a large number of lensed arcs (click on the image for larger version). These arcs are distorted images of background galaxies, gravitationally lensed by the mass of the cluster. The above image of galaxy cluster Abell 1689 is a prime example of gravitational lensing. Throughout the image are numerous small arcs, streaks, and strange-looking objects. Most of these are relatively normal galaxies (a few really are just strange-looking objects), whose images have been stretched and twisted by the galaxy cluster and general relativity. The combined mass of the thousands of galaxies in the cluster (and their associated dark matter – a topic discussed in the What is Dark Matter? 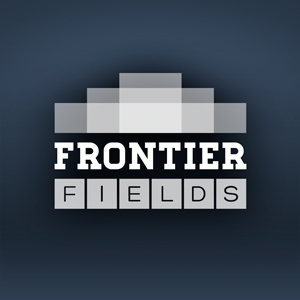 blog post) heavily distorts the space-time around the cluster. Light from more distant galaxies passes through that warped space. The images of those distant galaxies become distorted as if they were being seen through an odd-shaped glass lens. In fact, the physics of light redirection using gravity is entirely analogous to that using lenses. It is the optics of complex lenses, but using mass instead of glass. Newton’s gravity can not produce such gravitational lensing. Well, to be complete, a gravitational force could produce half of the lensing effect of general relativity, but only if one assumes that photons (i.e., particles of light) have mass. Modern physics considers photons to be massless particles, and hence gravitational lensing does not exist in Newton’s version of gravity, only in Einstein’s general relativity. For that reason, I like to say that pictures of gravitational lensing are visual “proof” of general relativity. You don’t have to delve into the astronomy, physics, or complex mathematics — just examine the image. Such distortions arise from general relativity. Now, the visual distortions may be easy to spot, but that’s not to say that these images are easy to interpret. Just the opposite is true. I’ll provide some examples of the complexities of understanding gravitational lensing in my next blog post. Excellent and simple. I loved it. May be is not “gravitational lensing” is just light lensing due to the enormous amount of heat, dark matter, energy, gas and magnetic waves creating them. I don’t, I just apply critical analysis, just like “them”. On this specific field there are several forces working together more powerful than gravity (e.g. supermassive black holes). When ISON came near the sun this effect was not seen and can override this assumption. Cosmic rays, galactic winds, magnetic fields, hot gas and the super jets from black holes all being ejected out of the cluster into the space can cause this effect. On the other hand gravitational force makes her way into the cluster and stops there. The lenses are located way out of the gravitational fields or weak fields. All other outward forces (jets) can reach several light years of distance. There is also an explanation when they see a lens on a single galaxy and is not gravity; the lens they see is aligned by the ejection location of that galaxy. We still need to learn what material accredited by the black holes is being converted to by the black holes; since this is almost transparent. Please be civil and avoid “flamebait” comments designed to provoke others. We will not approve and/or will remove such comments. Magdalena, the scales of gravitational lensing in a cluster of galaxies are hundreds of thousands to millions of light-years across. The ideas that you list are not more powerful than gravity on these scales. More importantly, none of the effects mentioned can produce the visual distortion of background objects seen in gravitational lensing. Thanks Dr. Frank, I was just responding something to a comment. I guess i’ll just have to take his word for it.